I have set up a new ILLUSTRATION PORTFOLIO Site. ILLUXCON-- OCT. 19-23, 2016, Reading, PA. I will be in the Artist Showcase. I am not planning on any other Cons or Shows in 2016. 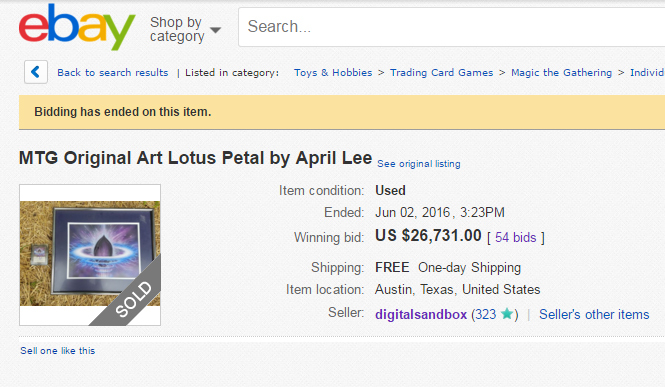 So---- Someone recently auctioned off the Original Painting of my Magic Card, "Lotus Petal" from the Tempest exp., 1997. Starting price $1,500.00. SOLD at $26,700.00 !!!! Wow. This was NOT MY AUCTION (unfortunately!). Just kind of cool to know about! 2016/5-- Updated: LINK to NEW Illustration Portfolio Pages. Unfortunately, I don't have a proper shop set up here. I am trying to figure out a good way to post what is for sale. Currently, I have many originals and a fair amount of digital and film prints on photopaper. Some of the images in the GALLERIES will indicate if I have prints or originals available, but my system isn't terribly exact, so please ask by email if you see someone you like. I will also try to indicate what prints I have in my LIST OF CARD GAME ART. PRINTS are chromira and photographic prints, most are 8.5" x 11" for $27.00 each plus shipping (around $5.00 for Priority, in U.S.). They are all individually SIGNED and NUMBERED, limited editions. Please note down which images you are interested in and Inquire by E-mail: aprillee@lycos.com . If I don't answer, please assume the email was eaten by my awful spam-filter and try again, thanks! Site's content is copyrighted to April Lee and various Companies where noted, 2007. Please Do Not Post Any of these images anywhere on the internet without permission--or use them for other purposes (including Tubes, Avatars, Icons and Altered Images). Many of these companies have legal departments that will defend their copyrights. Thank you for your consideration.